I don't think I really need to write much, because these photos speak for themselves! The Costa Rican countryside was breathtaking and made me consider adding "sit outside and stare at the trees" to my list of hobbies...not something I normally do in Dallas! 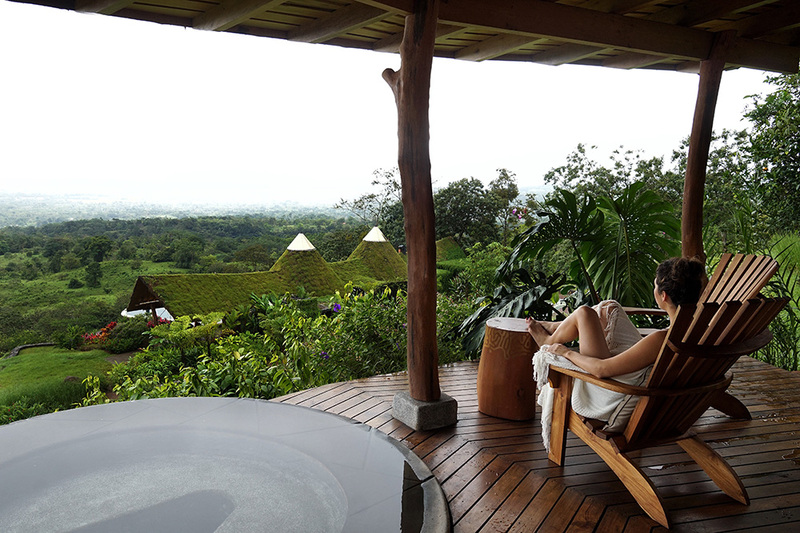 ;) I visited Costa Rica with my friend Brooke as a part of a media trip, meaning that we had the amazing opportunity to partner with Origins Lodge in Costa Rica to be hosted as their FIRST guests at the lodge. First. As in, noone had stayed there before us. AND we were the ONLY guests there because they had just opened and their next guests weren't scheduled to arrive until after we left, so we had the whole place to ourselves- talk about luxuryyy! Origins Lodge is a complete luxury destination- totally secluded and fully booked it only accommodates 22 people! It would be perfect for a wedding or honeymoon destination! We flew into the Liberia airport and a car drove us the 2.5 hours to Origins. When we arrived, we were greeted by the amazing staff team, who made sure we had the best time during our stay! 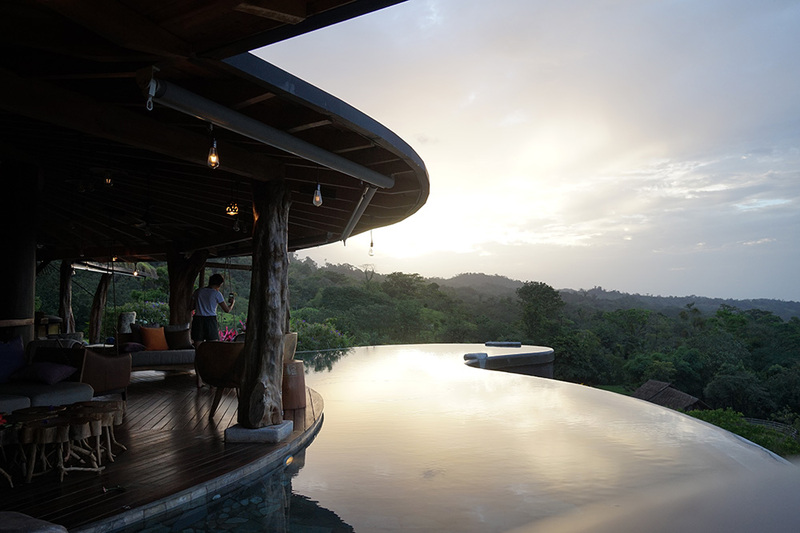 The clubhouse (both photos above) was completely open to nature, with a pool overlooking the rainforest! 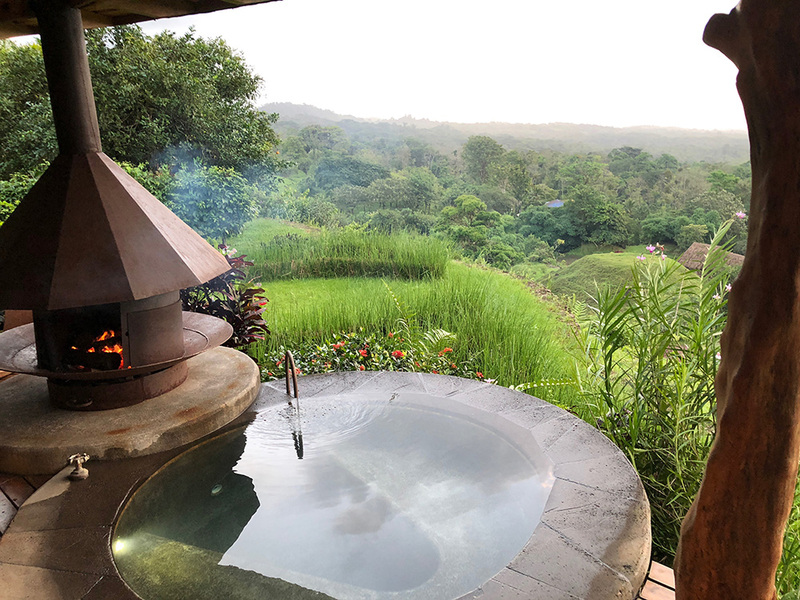 During our trip, I tried to embrace the Pura Vida life and be completely go with the flow- it wasn't hard at all because everything we did was so relaxing and the scenery was gorgeous! Back in Dallas now, it's a little harder to maintain ha! Each of us stayed in a private villa, with a heated dip pool, that had the same amazing view as the lodge! We got to swim multiple times a day (my favorite!) and relax in our villa pools at night and watch the sunset. The villas were amazing and I wish I had taken more photos of the interior, but it was definitely a different experience than anywhere I had visited before! There was no glass on the windows- only a screen, so it was all natural A/C, and you could hear the rain showers at night, which were so peaceful! We did encounter a few scary bugs, but not many...I was pretty proud of myself, but Brooke was definitely the brave one between us. 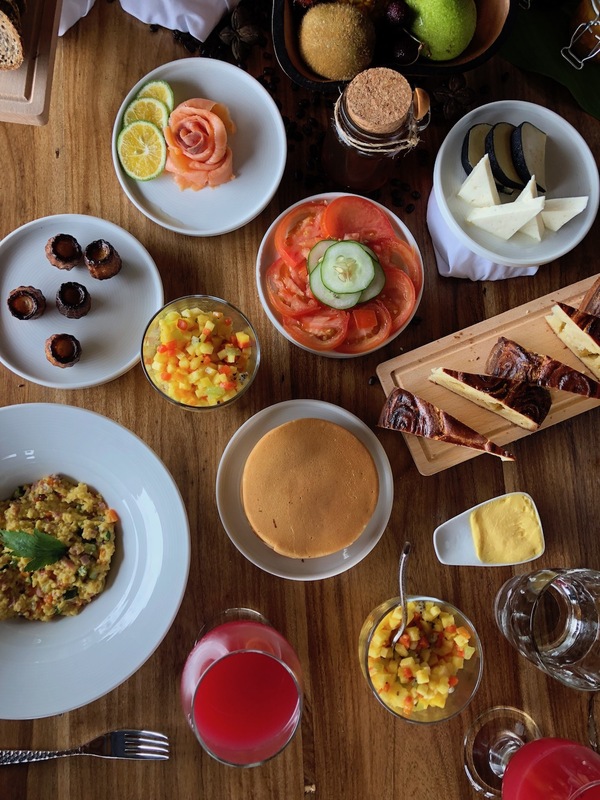 Every morning, we would walk down to breakfast and were greeted with an amazing spread of food on our table, ready for us to dig in! It was so tough not to eat everything! All of our meals were included in our stay, and the two chefs are French and so sweet! It was fun to enjoy some French-style foods that I ate while I was in Paris, but see the Costa Rican twist on them! There was a mix of Spanish, English, and French spoken between all of us, which was so fun! One of my favorite things that we were able to do onsite was hike to a waterfall! How amazing is this?!? This was my first waterfall experience ever, and I'm pretty proud that we had to work so hard for it! We hiked for about an hour, then of course took photos for about an hour. I'll never forget: when it was time to go, our tour guide, Juan Pablo, said "ok we are going to go up that way..." and I looked and didn't see anything! There was no path... only the side of a mountain. Hmmm. Ha! We pretty much had to climb a vertical mud wall to get to where we needed to be and it was so tough! We were shaking at the end of it, but it was all worth it! 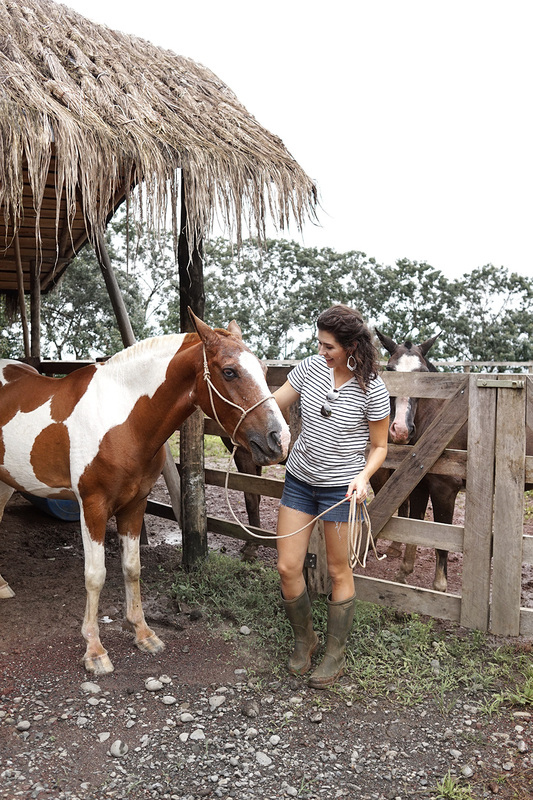 Luckily, we got to ride horses back to the clubhouse after our hike and waterfall adventure! Thank goodness because I was tired! (and I'm sure our tour guides were tired of us taking photos! haha! During our trip, I celebrated my birthday at Origins, and the team was so sweet and surprised me with a birthday cake- of course it was the most amazing cake ever- made by the French pastry chef. Hello, delicious. The multinational team sang to me in English, popped a bottle of champagne and helped me celebrate a new year! Couldn't have asked for a better birthday. Brooke said "I won't judge you if you have another slice of cake." and I said "YEP!" haha worth it! I shared a lot of the trip while we were there (thanks, wifi! ), but I posted my first IGTV video on Instagram and it's a short video recap of our trip- I've already watched it so many times and it makes me want to go back! 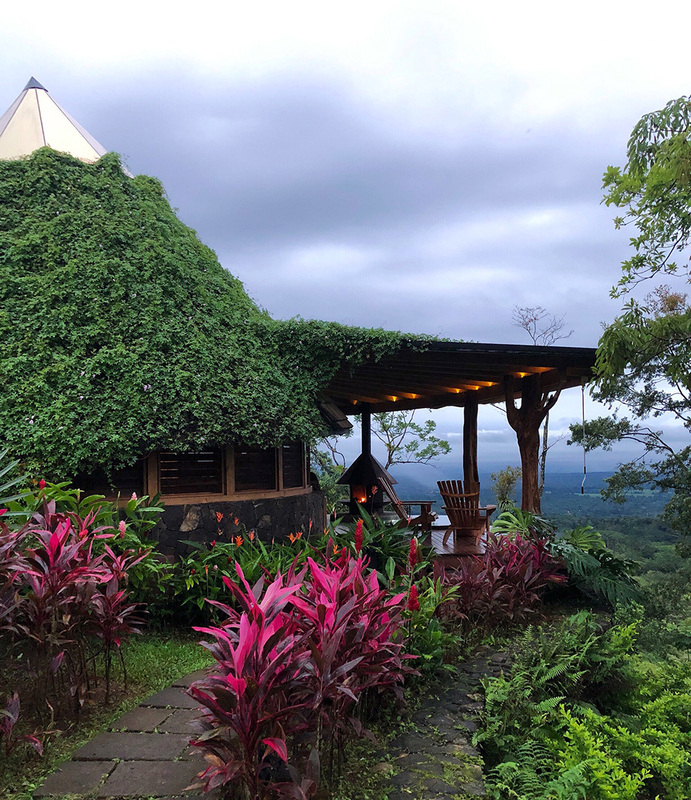 Costa Rica is beautiful, and Origins Lodge was the perfect place to enjoy the country, and such a fantastic experience for my first visit to Costa Rica! I definitely didn't have to write a post about this trip, but I wanted to share these beautiful photos of the scenery and experience! Enjoy!